Rewiew Opportunities to hear major international jazz artists outside of a festival context have become rather rare in Scotland, which made this week’s visits from this stellar European trio all the more welcome. 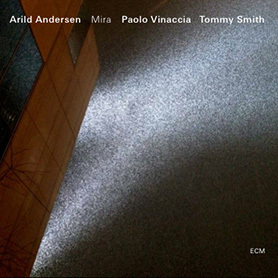 Arild Andersen Quintet . Tommy Smith Sax, Markus Stockhausen Tp, Marcin Wasilewski piano, Arild Andersen bass, Patrice Heral Drums. From a concert in Gjøvik with Arild Andersen trio ,Tommy Smith Sax ,Paolo Vinaccia drums.